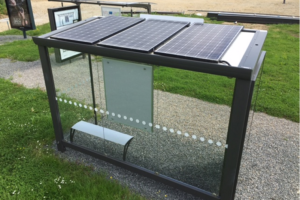 Solar AdTek supplied and installed a new solar powered bus shelter lighting system for Abri-Services. 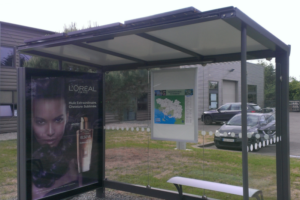 The system also incorporated a PIR controlled roof light which provides extra security and allows travellers to view the bus timetable at night. Using our patented Solar Control Unit and dimmable LED lighting ensures long lifetime of the system, of over 50,000 hours with minimum maintenance. 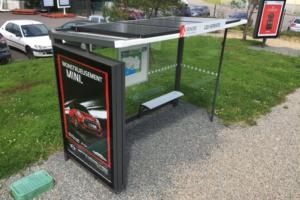 The system provides power for illumination of the advertising display and courtesy light in areas where it is difficult or expensive to connect to the grid. There are no ongoing energy costs and no carbon footprint. Nantes at 47 degrees North means that we have more energy available in Winter than Dublin and this means we can reduce the system cost with less PV required.